This blog is Part5 of the 5-part blog-series. 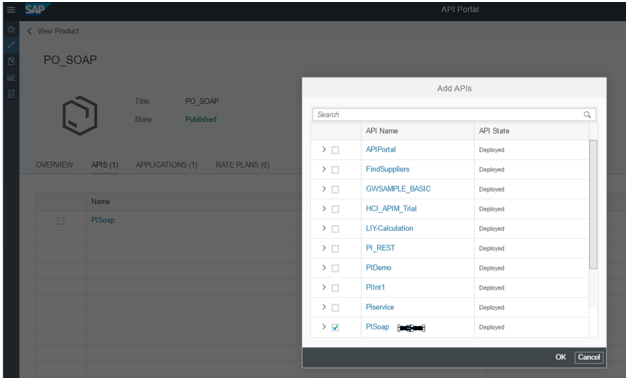 In this blog, we will introduce policies and will be able to manage Interfaces which are exposed from SAP Process Orchestration (SAP PO) through SAP Cloud Platform, API Management. Now I want to prevent unauthorized access to SOAP interface which is exposed as open API. Then update the policy by clicking Update. The APIKey ref is the key which is used while consuming this API. Since, the key is saved as request header, so the while consuming, this key is to be passed as request header. Also, Save the API proxy. 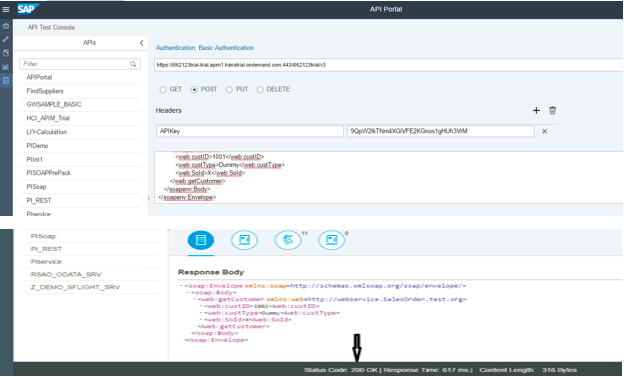 To consume the API via product, we need to know login to the developer portal. Once logged in, we will find the newly published API Product here. Give Name and other details and Save it. 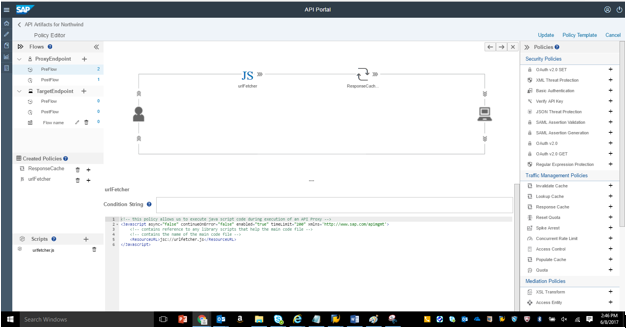 To test the API, we will be using the SAP API Management’s Test Console. Refer here for more details. Add the proper URl and Authentication (if any) in the Test Console. In this section, we will see how to improve Odata interface’s performance through reduced latency and network traffic by applying ResponseCache policy. Response Cache policy caches data from a backend resource, reducing the number of requests to the resource. As apps make requests to the same URI, you can use this policy to return cached responses instead of forwarding those requests to the backend server. 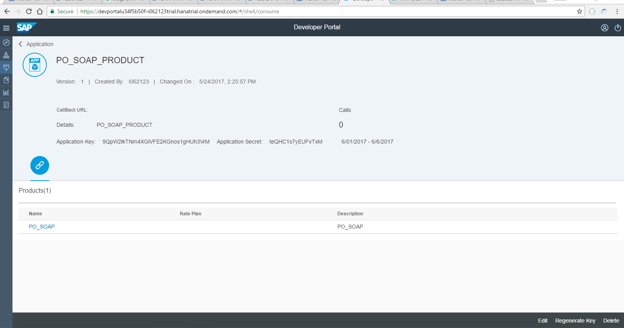 Open API Portal from your Hana trial account and click on Odata API already created. Navigate to Policy Editor and click on edit. Add Response Cache from right side to Post flow of proxy end point. Let’s cache complete response what we get after firing the GET call. So, we need a Java script policy which will get the URL and a condition that if it’s a “GET” call then only cache it. Click on Java Script and add it. Navigate to test console and click on Send. You will get a response in status bar. Since second time when we hit the proxy endpoint call to backend is not made instead, data is fetched from cache and hence reduction in time. In this section, we will see how to limits the number inbound requests. Though, this policy can be attached at the proxy endpoint or the target endpoint. At the proxy endpoint, this policy limits inbound requests. When you attach this policy at the Target Endpoint, it limits request forwarded to the backend service. Spike arrests are not implemented as counts. Rather, they are implemented as a rate limit which is based on the time. The last matching message was processed. If you specify 6 messages per minute, it means that requests can only be submitted at the rate of one per 10 sec intervals. A second request within 10 seconds on the same API Management server will be rejected. Let see with an example, How it Works! Navigate to Policy Editor and Apply Spike Arrest policy. Now let’s Send a request and Validate it! Since we have given 6 requests/min that means 1 req/10 seconds and if we try for second request in that 10 second it will fail.